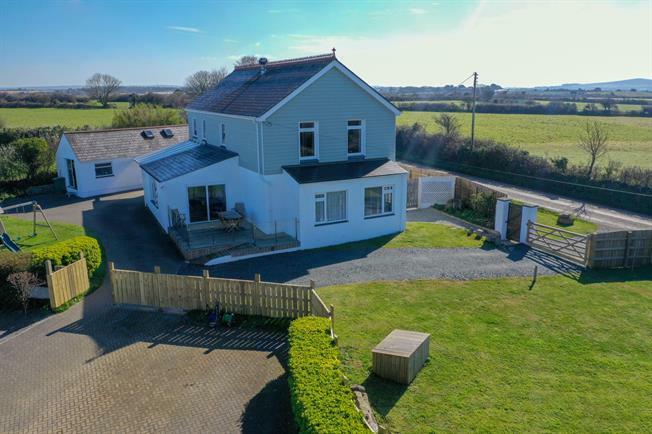 4 Bedroom Detached House For Sale in Hayle for Offers in excess of £550,000. Steppy Downs House is a delightful detached family home set in an elevated position enjoying far reaching sea and coastal views from Mounts Bay to Lelant estuary. This charming home is presented to a wonderful standard throughout and provides spacious, light and airy living accommodation as well as generous bedroom sizes and quality fitted bathroom suites. The property is entered via an entrance porch which leads to the inner hallway with feature tiled flooring. The first reception room is located on the left hand side of the hallway and is of generous proportions. This room provides flexible living options and could be used as a ground floor bedroom, study, secondary reception room or children’s play room. The main reception room is located in the centre of the property and features a central focal point being a modern multi fuel stove set within a cornish granite mantle with marble effect surround. From here French doors open to the formal dining room which again has French doors opening to a raised decked area where far reach rural and coastal views can be enjoyed. From the dining room steps provides access to the spacious kitchen / breakfast room which is fitted with a generous array of base and wall mounted units complimented by large work surfaces and splash backs. There is an integrated oven and 4 ring hob with space provided for an under counter fridge and dishwasher. Beyond the kitchen is the rear hall leading to the ground floor cloakroom / WC and separate utility room. The utility room provides further base and wall mounted units together with spaces provided for washing machine and tumble dryer. There is also a courtesy door leading to the gardens and parking area. At first floor level there are 4 generous bedrooms with the master bedroom providing en suite bathroom facilities. There is also an airing cupboard and family bathroom with bath and separate shower cubicle at first floor level. The far reaching views only improve on this floor and the large double glazed windows help allow plenty of natural light into the bedrooms. Externally there is ample driveway parking together with lawned gardens which wrap around the entire property. There is also a detached workshop / outbuilding which offers further potential to create additional accommodation if required or simply to use as garage or workshop space. The property stands in an elevated countryside setting surrounded by a rural landscape. It commands wonderful panoramic views. St Erth is the nearest village and provides a range of local facilities including general store/post office, the 16th Century Star Inn and a junior school together with a mainline train station to London Paddington. More extensive amenities can be found in the nearby town of Hayle or slightly further afield, Penzance. Steppy Downs House is well positioned for ready access to a number of other sandy beaches on both coastlines including the waters of Mounts Bay, Gwithian and St Ives. The following services are available mains electric, metered mains water, private drainage and telephone line is connected (however we have not verified connection). Hot water is catered for via immersion tank and heating is modern electric radiators. There are solar panels on the roof with a feed in tariff.